A computer simulation from 2016 Sloan Research Fellow Ryan Abernathey shows eddies forming in mesoscale turbulence. Watch a global simulation. When you examine the behavior of the global oceans closely – really closely, at scales smaller than 100 kilometers – eddies and jets and fronts start to appear. It’s called mesoscale turbulence, and it’s where the currents are the strongest and most of the kinetic energy in the oceans can be found. 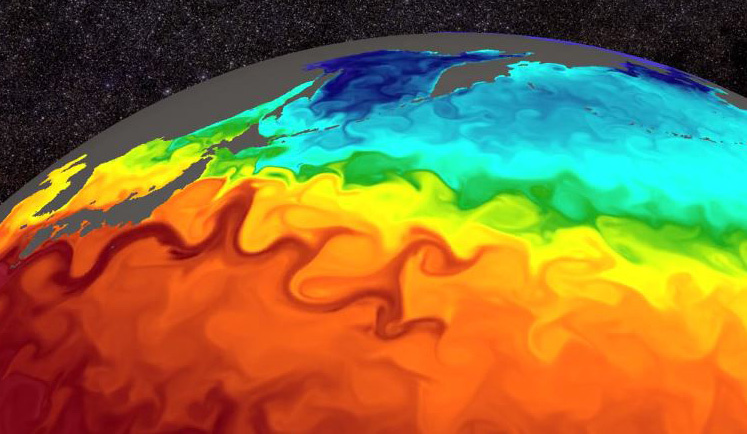 Mesoscale turbulence mixes heat and water from different parts of the oceans, as well as nutrients relied on by microbes like phytoplankton that are critical to ocean food chains and the air we breathe. Scientists are also discovering the potentially powerful roles it plays in the global climate. For Ryan Abernathey, who was just awarded a 2016 Sloan Research Fellowship, this is where ocean physics gets interesting. “We’re discovering that things that happen at those smaller scales have a big influence on really large-scale ocean circulation. The circulation that is overturning the whole ocean and influencing our climate depends on mesoscale turbulence,” Abernathey said. The better scientists understand mesoscale turbulence, the better they will be able to analyze past climate behavior and represent today’s turbulence in climate models for more accurate forecasts. For example, glacial cycles are believed to involve changes in ocean overturning circulation. “What drives those changes? What are the knobs that control them? There’s evidence that the mesoscale is part of that story,” Abernathey said. The Alfred P. Sloan Foundation chose Abernathey as one of its 2016 fellows for his success and his unique potential to make substantial contributions to the field of physical oceanography. 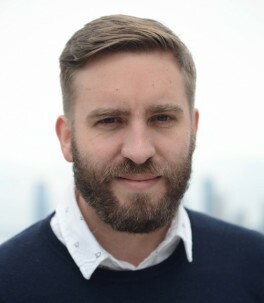 One of his large contributions so far has been his work using satellite data and computer models to quantify spatial variability of mesoscale mixing processes on a global scale. He and his research group at Columbia University’s Lamont-Doherty Earth Observatory are also looking at how mesoscale turbulence varies through time, not just over seasons but also over decades, and how that connects to long-term climate variability. When he’s not looking at the global picture, Abernathey – who also just became a new father – tends to focus on the Southern Ocean and influences on the Antarctic Circumpolar Current. His research has showed how mesoscale turbulence can buffer changes in the wind in the Southern Hemisphere, where the jet stream is shifting southward and strengthening, making ocean circulation less sensitive to wind changes than previously thought. He is currently working on understanding the role of sea ice in the Southern Ocean overturning circulation, among other projects. Mesoscale turbulence doesn’t fit in a lab, so Abernathey, who has been a programmer longer than he’s been a scientist, simulates that turbulence through high-performance computing. He and his research group build models of the ocean, encode the laws of physics into those models, and then let the models do their thing. The scientists can learn, for example, how much heat eddies are transporting and about eddies’ role in maintaining ocean circulation. “Twenty years ago, the models were way too coarse to resolve the fundamental length scale that would allow us to see mesoscale turbulence. Now we’re developing the ability to resolve this scale, and because of that, our models spontaneously develop this turbulence,” Abernathey said. Of course this isn’t happening on a standard laptop. Abernathey’s group participates in Columbia University’s Yeti high-performance computing cluster, a shared system that can handle the small simulations. For larger simulations, they turn to the Yellowstone supercomputing cluster run by the University Corporation for Atmospheric Research. Abernathey is big believer in the power of open source code for expanding scientific progress, and he publishes much of his research code online. The Sloan Research Fellowship provides $55,000 over two years to help early-career scientists finance their research, which could come in handy for the group’s computing needs. Abernathey was also awarded a larger, five-year NSF CAREER grant in February to work on the evolution of ocean mesoscale turbulence in a changing climate. Lamont Professor Arnold Gordon, who works with Abernathey had taught graduate courses alongside him in physical oceanography, described him as “a major player” in the field. Other 2016 Sloan Fellows from Columbia University include Matei Ciocarlie, Roxana Geambasu and Daniel Hsu in computer science; Cory Dean in physics; and Marcel Nutz in mathematics.